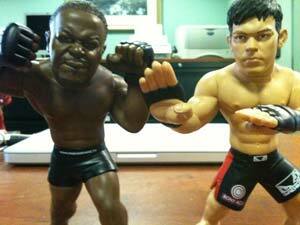 UFC Figures from Round 5 MMA Come to RustyBrick! RustyBrick programmers have a wide range of interests and hobbies. A few of us here, myself included, are huge fans of MMA (mixed martial arts) and UFC (Ultimate Fighting Championship). Readers of the blog may remember when Jimmy and I met Dana White, the president of UFC. Jimmy, Andrew and I also went to California to watch UFC 106, a live fight event. You may also remember when we created an application to log and track virtual fights in the UFC 2009 Video Game. 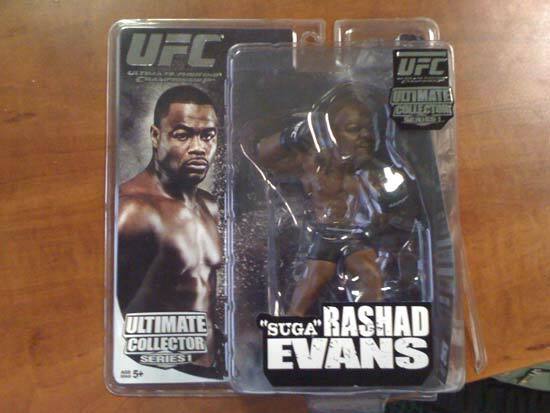 UFC (along with other MMA organizations) have partnered up with Round 5 MMA to release action figures of popular fighters. Being the generous, kind-spirited person that he is, Jimmy purchased a couple figures for Andy and myself for the Christmas holiday. So here's a quick hands-on review. Jimmy purchased the Round 5 MMA figures at the local Toys "R" Us. The first thing we noticed was the packaging. The packaging is quite large for a small product and comes with excellent artwork, included a large shot of the fighter and a foil UFC logo. Behind the figure, you can catch a glimpse of the fighter stats. The reverse of the package shows the other figures in the "series". (Round 5 MMA is releasing several figures at a time in each "series".) All the packaging art is custom to the figure in the box. 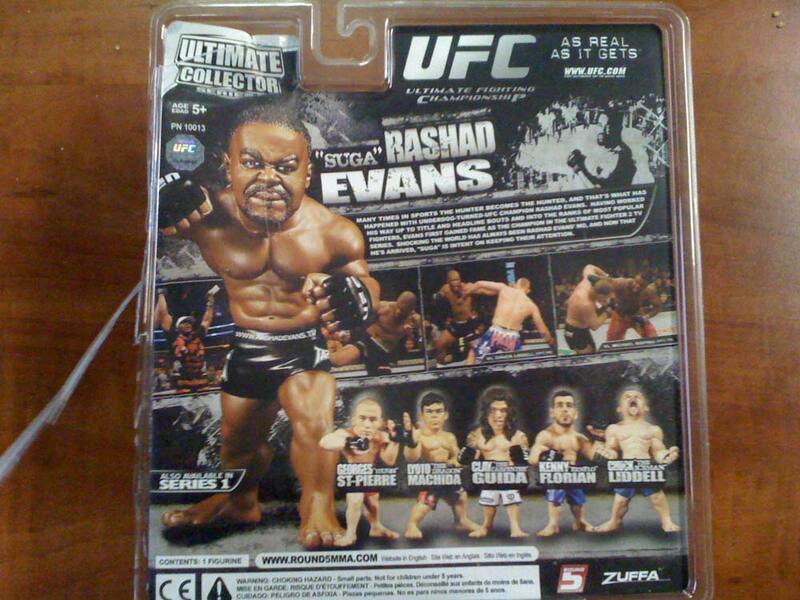 So the artwork for this Rashad Evans figure has all Rashad Evans pictures and a Rashad Evans bio. The actual figure is quite impressive. The figure is surprisingly heavy and solid. It also has 8 points of articulation so you can get the fighter into the perfect pose. 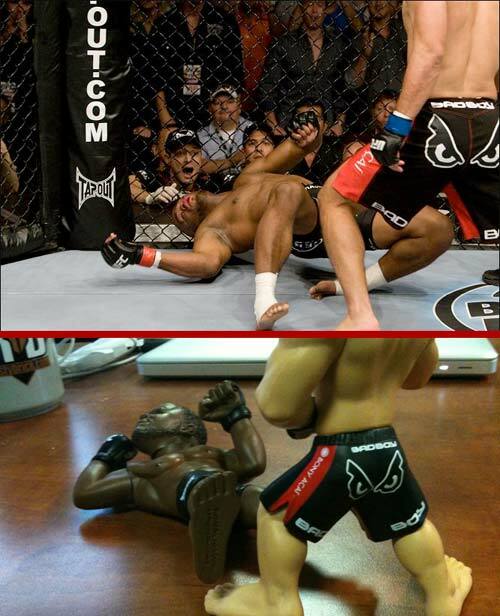 In the picture below, I do my best to recreate UFC 98 where Lyoto Machida knocked out Rashad Evans. All in all, I would definitely recommend these to any UFC or MMA fan. They have a ton of different fighters ranging from UFC greats like Georges St. Pierre to Strikeforce fighters like Gina Carano. They're solid figures and the characature look makes them alot of fun to pose and play with!